On Tuesday, January 12 of 2010 I was on my way home when a news story came across the radio. Haiti had been struck by a massive earthquake. Reports were still being solidified, but the initial headlines were that Haiti sustained significant damage to what little infrastructure she had, as well as potentially devastating loss of life. I rushed home and turned on the news. It was everything that had already been reported and worse. The world watched as the coverage spread: the port was in ruins, buildings all over the Port-au-Prince area and beyond had collapsed, the dead lined the streets, and the displaced wandered searching for loved ones. My heart was breaking; my husband got home, and together we wept as we watched nightly coverage every day for the next many weeks. You see, my son is Haitian. Through our adoption of him, we came to love Haiti and her people. We also had people we cared about personally in Haiti. The people at God’s Littlest Angel’s Haitian Baby Ministry had showered our son with love and care before we were able to do so. Throughout our adoption, our regular contact with the team at GLA had endeared them to us. Particularly special to us was Melanie. She had been the one to send monthly updates about our son, and she seemed to delight in sharing the little details of his personality. As we watched the coverage and followed the clipped, ultra-efficient (when you’re busy surviving, you don’t have time for much more) from GLA, it became clear to us that GLA and Haiti needed people with medical skills or connections. Sadly, we had neither. We waited with baited breath for every update because prayer was our service to Haiti and her people. We knew that prayer wouldn’t put food in their mouths, but we knew it connected us with the God who could. Enter Beauty from Ashes. We were able to visit with Melanie a few years ago during a Haitian adoptive family gathering. We were so blessed to see her, and as we spoke, she shared some of her story. When we discovered that she was writing Beauty From Ashes, we couldn’t wait to read it. Make no mistake: this is not entertainment. However, Melanie fills it with the kind of detail we were starved for as a family with Haitian connections, but knew the team didn’t have time to field questions about at the time. Melanie walks us through, day by day, what she and the team had to do to care for the children, help support the staff, and survive themselves emotionally as they were rocked by one aftershock after another. Most of all, though, she reveals God’s not-a-moment-too-soon provision for the children and staff as water and food and supplies came just when they were needed, and sometimes from unlikely places. 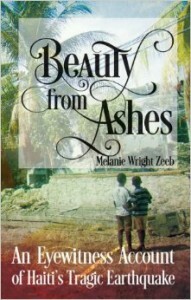 Melanie’s riveting, first-hand account of her experience living through Haiti’s earthquake is absolutely visceral. It cuts through the sound bites, sensationalism, and headlines and gives the reader a front-row-seat view into the heart and mind of one woman, loving and helping the Haiti she loves, and clinging to each next task as a means of getting through unspeakable fear and heart-rending loss. There’s so much here. Once you start, you won’t want to put it down. Melanie also deals with the hard question of “why” in a country so vulnerable already, by leaning on the following scripture: I Kings 19:11-13 And he said, “Go out and stand on the mount before the Lord.” And behold, the Lord passed by, and a great and strong wind tore the mountains and broke in pieces the rocks before the Lord, but the Lord was not in the wind. And after the wind an earthquake, but the Lord was not in the earthquake. And after the earthquake a fire, but the Lord was not in the fire. And after the fire the sound of a low whisper. And when Elijah heard it, he wrapped his face in his cloak and went out and stood at the entrance of the cave. Beautiful, though painful. Beauty From Ashes. As Melanie grows in her faith, recognizing the stark beauty of God’s love and provision for her and others in contrast with the earthquake’s staggering devastation, it will leave you both moved for this beautiful nation, and quietly reverent of God’s hand in the midst of it.